Illinois state law requires all employers with at least one employee to carry workers’ compensation insurance. Unfortunately, not all employers secure the required amount of insurance to cover all of their employees. If a company fails to purchase insurance to cover an accident on the job, the employer can face criminal penalties, criminal charges, and civil liability for a work injury. By law, employers must display a notice in a prominent area in the workplace outlining the proper procedures to follow after a workplace injury, as well as how to get more information on workers’ compensation. The notice should also list the name of the workers’ compensation insurer, the employer’s policy number, and the dates on which the insurance policy was created and will terminate. An employer who fails to secure workers’ compensation insurance can face a fine of $500 for each day that the insurance is not provided, with a minimum fine of $10,000. These fines are deposited into the Injured Workers' Benefit Fund, and may be ordered against the company or one or more corporate officers. Fines may also be levied against employers who neglect to make out an injury report after a workplace accident. Criminal charges. It is a class 4 felony for an employer in the state of Illinois to knowingly fail to carry the required workers’ compensation coverage. 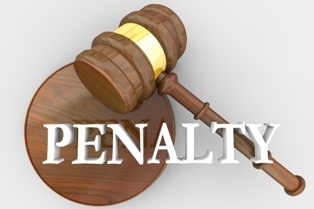 If an employer is convicted, he or she may face imprisonment for up to three years and a fine of up to $25,000. If the employer did not have proper coverage but was unaware of the fact (such as failing to secure sufficient coverage or allowing the policy to lapse), he or she may still be guilty of negligence and charged with a misdemeanor. Injury claims. Workers' compensation laws were created to protect injured workers, but they also provide a good deal of protection for employers who provide insurance. If the employer fails to keep up this end of the bargain, the employer is no longer protected by the “exclusive remedy” provision of workers’ compensation, and injured employees may file lawsuits against their employers to recover the costs of the accident. Retaliation lawsuits. If an employer wrongfully terminated or retaliated against an employee who had a legitimate claim under the Workers' Compensation or Occupational Diseases Acts, the employee can sue the employer for the damage done to his reputation in addition to recovering the costs of a workplace injury. If you have been injured on the job, we can advise you on your next steps at no cost to you. Contact the experienced workers' compensation attorneys at Tapella & Eberspacher today at (855) 522-5291 or fill out our online contact form to schedule your free consultation.